Many individuals are unhappy with the appearance of their nose. Whether this is a life-long issue or due to an alteration of appearance from injury or a previous rhinoplasty, Nose Reshaping, technically referred to as rhinoplasty, offers a solution. There are many ways that a rhinoplasty can improve the appearance of the nose as well as improve the balance, proportion, and attractiveness of the face. The overall size can be reduced or increased, the tip refined and its projection increased or decreased, the nostrils narrowed, the bridge reduced and defined – all leading to a more harmonious, balanced and attractive appearance. 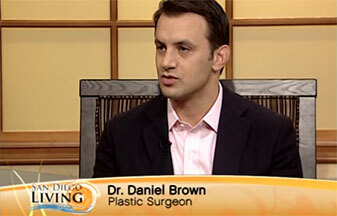 Contact Dr. Daniel Brown to learn more about nose reshaping and achieve your aesthetic goals! Nose reshaping, or rhinoplasty, adjusts proportion and corrects irregularities to restore balance and facial harmony. As an anchor point of the face, the nose has a subtle, but profound impact on your overall appearance because even slight imbalances can throw off the appearance of other facial features. Symmetry is a foundation of beauty and your nose is a cornerstone. Large, bulbous nasal tip? Crooked or deviated septum? Large hump on the bridge of your nose? These are all common experiences and very treatable with nose reshaping surgery. A rhinoplasty is an extremely popular treatment performed by Dr. Brown and consistently delivers: rhinoplasty satisfaction rates are extremely high. Our noses are highly specific to each of us, meaning a rhinoplasty is a highly individualized treatment tailored to each person’s anatomy and goals. Rhinoplasties are indicated for cosmetic and functional reasons. This treatment can both restore facial harmony and repair damage and deformities that interfere with nasal function. Cosmetic or functional nose reshaping treatments may be performed in a single treatment or separately. Repair of damaged, malformed or constricted nasal passages. Younger patients considering surgery to reshape their noses should wait until their nose is fully developed and facial growth is complete, which generally occurs at the ages of 15 for girls and 16 for boys. If you are dissatisfied with the shape and proportion of your nose, schedule a consultation with Dr. Brown and he can develop a customized plan that will help you achieve your aesthetic goals. Nose reshaping is a surgical procedure which must be tailored to each patient. Generally speaking, there are two major styles of rhinoplasty: open and closed. These styles refer to the manner of the surgical approach, whether incisions are made within the nasal passage or on the exterior of the nose. There are a number of benefits to each style and the right approach is highly dependent on the goals and anatomy of the patient. Recovery: Splint may be worn for up to a week. Any bruising or swelling usually resolves within ten days. Results: Some immediate correction, but final results appear once the swelling subsides and healing completes. Some people may have heard of “primary” versus “secondary” rhinoplasties. These terms simply refer to specific types of rhinoplasties. Primary rhinoplasties are performed for those who have never undergone previous nose reshaping or surgical alteration of their noses. Secondary rhinoplasties are performed to correct issues created by a primary rhinoplasty or if the patient desires additional nasal enhancement. Secondary rhinoplasties are typically a bit more complicated due to the considerations of scarring and previous anatomical rearrangements that must be kept in mind. Previously altered bone structures and nasal structures must be carefully considered when planning a secondary rhinoplasty. Nose reshaping can reduce, augment or repair structures of the nose. Reduction rhinoplasties are indicated for those who have overdeveloped structures or features of the nose that are disproportionately large compared to the rest of their face. Reduction procedures involve removing excess tissue from structures such as the cartilage tip or bony bridge of the nose to create a smaller, proportionate shape. Augmentation rhinoplasties are aimed towards increasing projection and size. Adding height and contour to the bridge a common example. This method involves grafting additional tissue or bone to the nose that is taken from a donor site elsewhere on the body. If donor cartilage and tissues are unavailable, customized, synthetic materials may also be used. Nose reshaping is also effective to repair damaged nasal structures. Trauma to the nose caused by sports injuries, disease, congenital defects or poorly performed primary rhinoplasties may involve both augmentation and reduction strategies to restore the natural appearance of the nose. Preparing for nose reshaping surgery can ensure that you have the best possible experience and are satisfied with your results. Nose reshaping surgery is typically performed under twilight or general anesthesia. This is an outpatient treatment meaning you will be able to return home immediately after your treatment. Once you are resting comfortably, incisions are made according to the open or closed styles. The chosen method is determined during your consultation. If the treatment is performed in the open method, an incision is made on the exterior of the nose along the soft tissue between the nostrils (called the columella). The incision enables ease of access to the nasal tip and larger nasal structures. The open method is ideal for more complex nose reshaping treatments. The open method, for example, may be better-suited for nose reshaping treatments where nasal humps are to be reduced. In the case of closed rhinoplasties, the procedure is performed through incisions made inside the nostril on each side. Incisions made in this style are not visible, which is the main benefit. Additionally, this style typically involves a shorter healing time but is usually best-suited for minor reshaping procedures. The determination of open or closed surgery will be made during your consultation after a thorough examination of your nose and discussion of your personal goals. At the conclusion of your surgery, (approx 1 – 2 hours) a nasal splint and bandages are applied to your nose. The splint will need to stay on for approximately a week to protect the new contours of your nose. Bruising and swelling are to be expected and may be pronounced around the upper face and eyes. Pain medication will be prescribed to control any discomfort you are experiencing. During the initial stages of your recovery, Dr. Brown recommends that patients avoid showers or activities that may wet the nose or place the nose at risk of any trauma. Blowing your nose, extreme facial expressions and wearing glasses should be avoided during the first few days. After five to seven days, most patients are able to return to light, daily activity and work. Bruising and swelling around the eyes may linger for up to ten days. Depending on the extensiveness of reshaping accomplished, the results of surgery are noticeable immediately. It may take about six months for the majority of the healing to be complete and the final results of the nose reshaping to be visible. In some cases, it can take a year before your restructured nose settles into place. Your private consultation is a very important element in the overall process of rhinoplasty. Our discussion will make sure that you have realistic expectations of what can and can’t be accomplished with a rhinoplasty. Many patients finding bringing photos of their desired results to be a helpful tool during their consultation. After a physical examination and a discussion of your medical history, we will review the procedure plan together to assure that your expectations are met so that you are happy and satisfied with your result. Our priority is to ensure every candidate is comfortable and to match you with the treatment that is appropriate to your unique goals. The cost of nose reshaping is determined after your consultation. Each treatment requires specialized planning due to the customization involved and the variety of surgical strategies available. To receive your personalized quote, schedule your consultation with Dr. Brown.